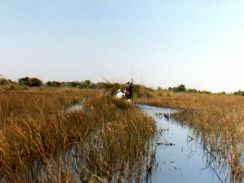 It was the Okavango Delta that called us for our first Botswana adventure. I had to include warthogs in these photos; they're so darn ugly that they're cute. I just love 'em. Just look at that face! You'll surely see all those animals in Botswana, but how much of an adventure your trip is... is up to you... your attitude and sense of adventure will make (or break) any trip. Go willing to try anything and be flexible. I think sometimes serendipity plays a roll in any trip... so you should always be prepared to make the most of whatever is thrown in your way. There were three of us traveling together after we left our friends on our visit to Rwanda to see Mountain Gorillas. 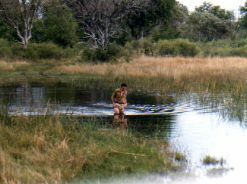 We didn't know much about the southern part of Africa so we were really up for a Botswana adventure. 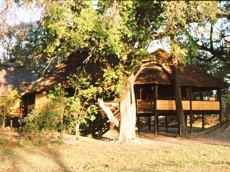 Our first stop was Chobe Game Lodge. It was a wonderful experience.... I mean Elizabeth Taylor and Richard Burton had honeymooned here... twice!... It's been visited by presidents and princes, so what was not to like? But Chobe Game Lodge a luxury lodge... what were WE doing here? ...but just after that is when serendipity stepped in. We flew from Kasane to the original Camp Okavango in a bush plane. Wow! As our little plane flew from the dry plains to the swampy Okavango Delta we started wondering where we would land. We flew low over a speck of an island... there was a grass runway... covered with Red Lechwe, a swamp loving antelope. Should we worry about hitting one? Our pilot was obviously used to this... and he wasn't attempting to land on that first pass, just scare the lechwe off the runway! 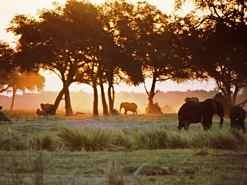 Now, we thought, we really begin our Botswana adventure! Our low fly-by also alerted the camp staff that we were about to land. Just a short walk from the plane, we were in camp... tents to be sure, but African tented camps have nothing in common with your childhood camping memories. It LOOKED like tents and a dining pavilion; it had the feel of adventure with all of the creature comforts... tented camps in Africa are a wonderful experience; they feel exotic... make YOU feel a little more like an explorer. The most amazing thing was that we were the only ones there.... serendiptiy again. 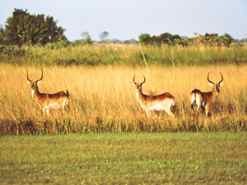 We explored the Okavango Delta and hippo waterways in makoros, catching sight of those lechwe and their smaller cousins sitatungas. We saw lots of birds, and we enjoyed wonderful food and great South African wines. 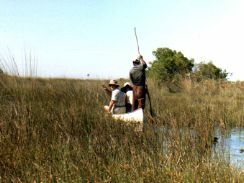 After a couple of days in Camp Okavango, they put us in a boat to make our way to the original sister camp -- Camp Moremi in the Moremi Game Reserve. We arrive at the dock in Camp Moremi to find that again we were the only three in the camp! A Piper Tri-pacer landed on the dirt strip near the camp and out jumps a young Ralph Bousfield. Our travel buddy Jamie grabbed me and said "Hold me down girl, I'm about to fall to my knees and bay at the moon." He showed us bushbabies and Africa grey wild cats and the time of our lives. We weren't clients... we were travelers! We forded streams with Ralph wading though first to make sure the engine wouldn't flood. We roamed the edges of camp in the evenings to see it we could spot night birds and little critters. And we had to get used to more great food and wine.... Oh yea, we want to encourage you to take a Botswana adventure, but don't think you're going to "rough it"! This was our last stop in Botswana, and we didn't want to leave. 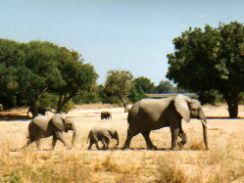 What called us back to Botswana was that it seemed like we were back to the old Africa of tented camps and Hemingway. 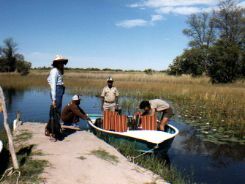 I guess it's way to personal and too long a story to tell of the tragic saga of an aborted visit in 92 when Ralph's Tri-pacer lost power and crashed in the Okavango... when we saw Jack's camp in the Makgadigadi Pan.... before Ralph made it into Jack's Camp in memory of this father. We've been back again to see Ralph well and running Jack's Camp, and, if possible, he's even more enthusiastic about Botswana and its Makgadigadi Pan's history and wildlife. 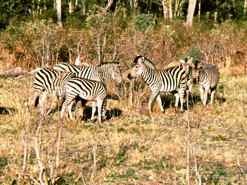 Uncharted Africa has become a partner of an African travel company called Natural Selection Travel. You can see more about Jack's Camp and others on their partner page if you want to check it out. 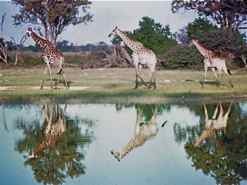 Are You Ready for Your Botswana Adventure? There are tons of sites that will give you all the facts and figures and sell you tours. 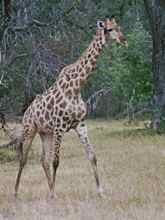 We just want to get you familiar with Botswana, and get you excited about traveling there or anywhere. 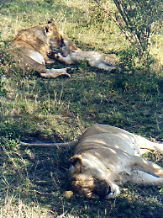 There is a dizzying array of wildlife lodges and camps. Botswana is not an economy destination... but it will be worth it. Choose the lodge or camp or safari company that best fits your budget... trust that any experience will be wonderful... and be prepared for serendipity. Grab whatever Botswana adventure is thrown your way.